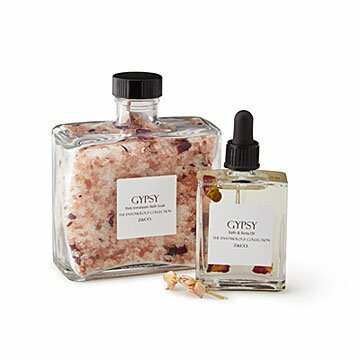 These pretty bath sets combine botanical-infused pink Himalayan salts and calming essential oils. Imagine you're relaxing in a moonlit garden. Sweet smells linger in the warm air and all is calm. Your whole body melts into the moment. Create this luxurious experience in your own bathtub with these natural bath oil and salts sets. Handmade by Zee Thomas and her team, each set pairs a botanical-infused pink Himalayan bath salt with a bottle of soothing essential oils. Treat yourself to rose petals and sweet geranium (Gypsy) or drift off in a sea of lavender and jasmine (Lavender Moon)—or give a set to someone who deserves their own "me time." Handmade in Galveston, Texas.